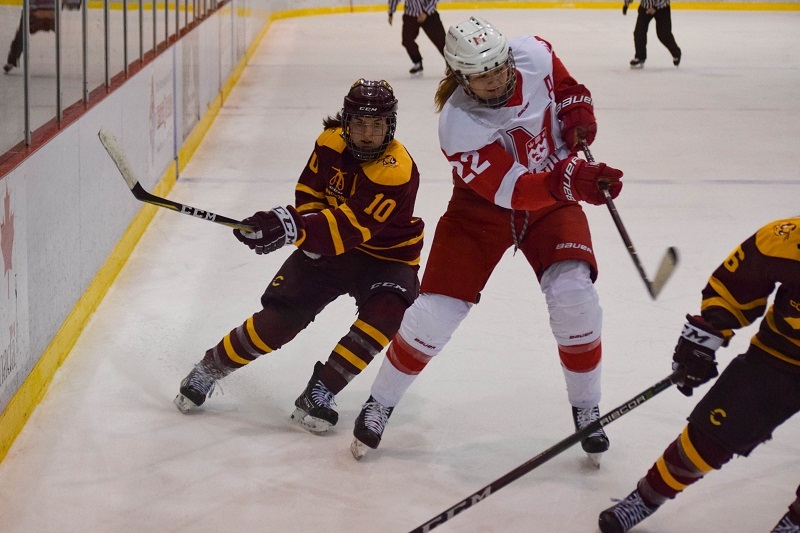 The Concordia Stingers women’s hockey team were eliminated in the Réseau du sport étudiant du Québec (RSEQ) semi-finals by the McGill Martlets Saturday afternoon. The Martlets won 5-3 after the Stingers opened the game with a 3-0 lead at the McConnell Arena. The game started well for the Stingers as they established dominance early in the first period. Forward Claudia Dubois opened the scoring 10 minutes into the game with her first goal of the series. Concordia head coach Julie Chu said that after Thursday’s loss in game one, the team wanted to improve for Saturday. The Stingers haven’t beat the Martlets in a playoff game since 2005. Photo by Mackenzie Lad. The Stingers had a three-goal lead in the second period when forwards Rosalie Bégin-Cyr and Maria Manarolis scored two goals in less than five minutes. However, the Stingers lost their momentum after Manarolis’s goal, as the Martlets called a time-out and made a goaltending change. The Martlets then scored five unanswered goals. Chu said her team maintained a good position all game long despite the score. The Stingers also had seven shots in the third period, but couldn’t beat back-up Martlets goalie Amanda Hadwen. Chu said she was still happy with how her team competed in the third period. The Stingers won the RSEQ championship last year, but couldn’t win a playoff game this season. The head coach wants to use this loss as motivation for next season. Main photo by Mackenzie Lad.